Skulls and Bacon: Hey Chicago........BACON! Yo, bacon-lovers in Chicago listen up! Stephanie Izard, bacon aficionado and winner of Bravo’s Top Chef (2008) is putting together a dinner for you. On September 2nd, Chef Stephanie Izard will be whipping up the second Wandering Goat dinner, part of a traveling dinner series leading up to the opening of her new restaurant, The Drunken Goat. The menu for the Wandering Goat dinner is all about the bacon! “After having so much fun at the last dinner, I am really looking forward to meeting another group of new people and sharing some of the new creations I have been working on. At my restaurant, the Drunken Goat, we will serve our own cured meats (including bacon), so lately we have tried out a bunch of different cures and smoking methods. I’m excited to share my findings!” says Stephanie. Some of the menu items listed are: Bacon Crisped Oysters, Bacon and Smoked Trout Salad with Heirloom Tomatoes, Aji-Braised Pork Belly, and a selection of different Bacon Gelato from Black Dog Gelato. If I was even close to Chicago I would be there in a heartbeat! If you're interested in going you can follow Stephanie on Twitter (@stephanieizard) where she will announce when the tickets are available for purchase. Price is $65 which includes all food and drink, and the secret location will be unveiled to ticket owners a few days before by email. Baconfest has been postponed til April 2010. They said they just couldn't pull it off right now and they want to make it a perfect event. I think you gotta try to fly in. 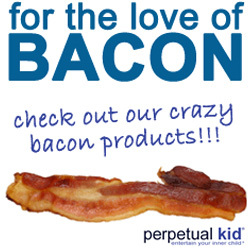 We do love our pork products here in Chicago!